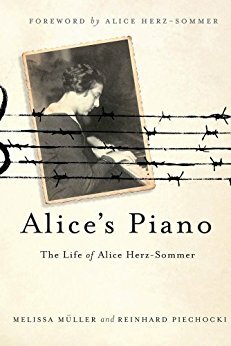 How music provided hope in one of the world’s darkest times—the inspirational life story of Alice Herz-Sommer, the oldest living Holocaust survivor. Alice Herz-Sommer was born in Prague in 1903. A talented pianist from a very early age, she became famous throughout Europe; but, as the Nazis rose to power, her world crumbled. In 1942, her mother was deported to the Theresienstadt concentration camp and vanished. In 1943, Alice, her husband and their six-year-old son were sent there, too. In the midst of horror, music, especially Chopin’s Etudes, was Alice’s salvation. Theresienstadt was a “show camp”, a living slice of Nazi propaganda created to convince outsiders that the Jews were being treated humanely. In more than a hundred concerts, Alice gave her fellow prisoners hope in a time of suffering. Written with the cooperation of Alice Herz-Sommer, Melissa Müller and Reinhard Piechocki’s Alice’s Piano is the first time her story has been told. At 107 years old, she continues to play her piano in London and bring hope to many. This was one of my favorite books of 2016. I have read a lot of WWII books and although this was similar to some I have read, it was also very different. This tells the story of a musician, which is a different view than I had ever read. It tells the story of a survivor of a concentration camp, but in many ways it is so much more. This books tells the story of the power of music and how it can change your life and give you the will to survive. If you enjoy WWII biographies and books, this is a must read.